Record numbers of women are engaging in state policy advocacy! When women become more engaged in the state policymaking process, we end up with better public policy – that ultimately can improve the status of women and girls in Georgia. On the other hand, when women are not at the table when public policy decisions are being made, policies are created that do not reflect the realities of women’s lives. 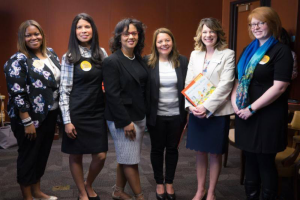 To see examples of how state policy impacts women, read a summary of proactive legislation that will improve the lives of women and girls from the 2019 State Legislative Session, as well as issues that you can advocate for in the next legislative session! 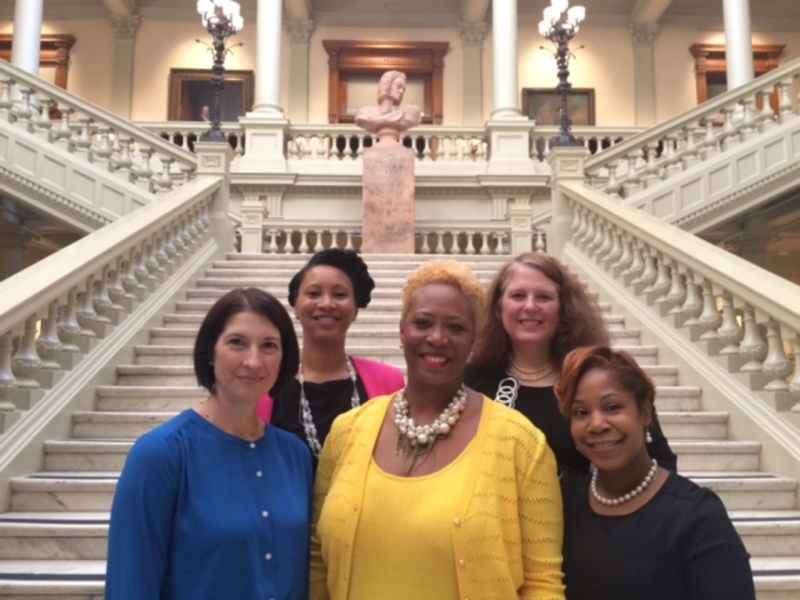 We know that a record number of women are seeking new ways to get engaged in policy and advocacy in Georgia. But research shows that women face unique barriers to leading in the public policy arena, from gender and/or racial discrimination, additional caregiving responsibilities, lack of comfort with the policy process, a hostile climate for women, or a lack of a critical mass of female role models. Research also shows that effective resources dedicated to increasing women’s political participation can overcome some of these barriers. In the Institute for Women’s Policy Research report, Status of Women in the States, Georgia earned a first place ranking in “Women’s Institutional Resources.” These are resources that are dedicated to helping women succeed in political and civic engagement – including empowering women to become involved in the public policy change process, or building the pipeline of women running for office. To connect women with these resources, we are featuring local programs and organizations that are dedicated to helping women succeed in political and civic engagement on this site. This is not a comprehensive or static list, and opportunities will be updated frequently, so keep checking this page! Are the opportunities this organization offers right for me at this time (e.g. am I ready to run for office, or do I want to advocate for policy change)? Do I need to be a member of this organization in order to get involved? Is there an application process? If so, when is the deadline? Is there a cost for program participation? If so, are there scholarships available? What type of time commitment would be required (e.g. how long does the program last; does it meet on weekends, weekdays, or nights)? 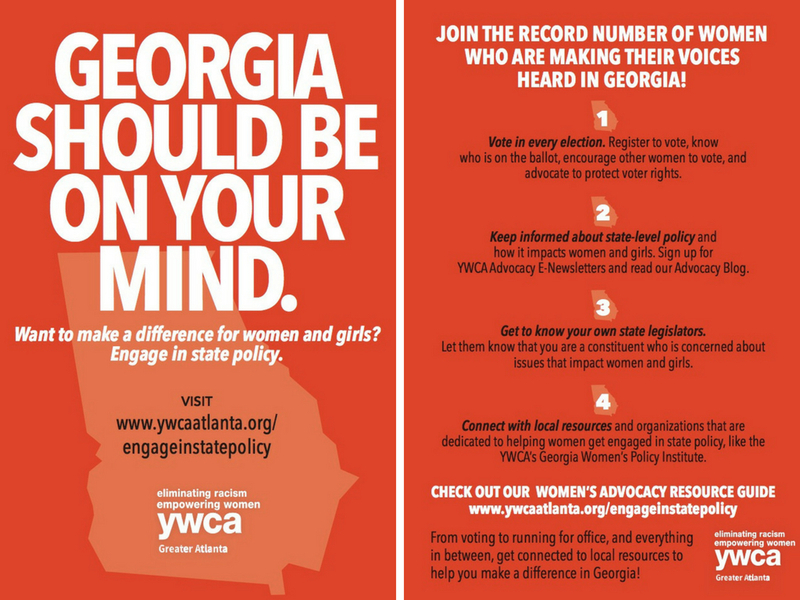 Is the organization affiliated with a political party (note that YWCA of Greater Atlanta is non-partisan)? Once you have found a resource or organization, sign up for their e-newsletters and reach out to learn about upcoming events and opportunities to get involved. What are we missing? Let us know about other resources to feature on our website by sending an email to [email protected]. Click HERE for a postcard that you can share with your friends and networks to encourage them to get involved in state policy! This effort to help increase women’s civic engagement was initiated with support from the Community Foundation for Greater Atlanta.